Early last year Renault had announced its plans to develop a small car for India to compete against the largest selling car in the country ‘Maruti Alto’. 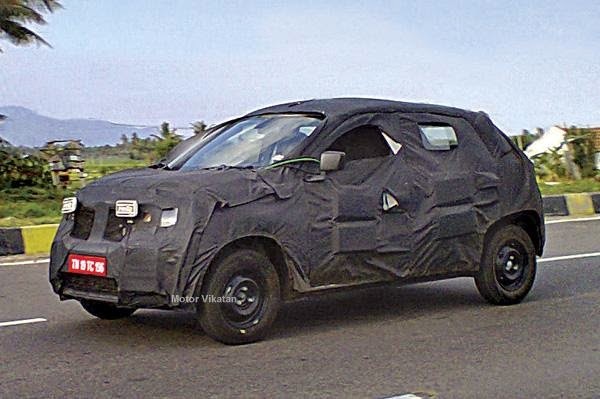 Here is the first spy picture of Renault’s small car for India undergoing testing on Indian roads. As seen from the picture, the car looks bigger and taller than the Alto. Heavy camouflage gives minute details of the car but it is evident that Renault is serious about competing with Alto which has been the bread and butter car for India’s largest car manufacturer ‘Maruti Suzuki’. The dropping down bonnet and a arch roofline suggest the Renault’s small car to be more rounded with smooth contours unlike European cars with sharp edges. The front end will feature Renault’s signature grill with a large Renault diamond logo on it. Renault will fit its latest 3 cylinder 800cc petrol engine in the new small car. The engine has been exclusively designed for the vehicle and is optimised to deliver good performance and better fuel efficiency. The engine is said to deliver 21 Km per liter of petrol. As of diesel, Renault has no plans to launch a diesel variant as of now. Renault’s small car will be priced around Rs. 4 lakh. Other cars along with Alto at this price point are Hyundai Eon & Datsun Go which will also be hit by the competition.